Jersey Water currently supplies treated water to approximately 90% of the Island population through its treated water mains network. If you are unsure as to whether there is a water main in your area please contact the Network Department on 707300. 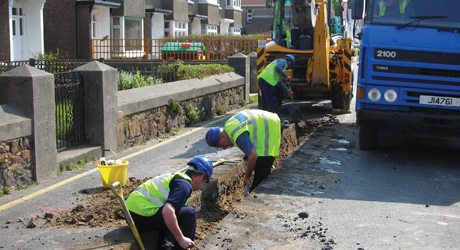 If you are not connected to the mains network and there is a water main near to your property then getting connected can be straightforward. Please contact our Network Department on 707300 with details of the property you want to connect to mains water and they will provide you with a written quotation. On receipt of payment we will then schedule your connection into the programme of works. You will be required to undertake internal plumbing alterations as necessary to bring your plumbing into line with the Water Byelaws and lay a supply pipe to connect your plumbing to our metered supply. All work should be undertaken by a qualified plumber. You should ensure that your plumbing system is sufficiently robust to withstand mains water pressures. There will be circumstances where there is no main in the vicinity of a property or group of properties and no planned mains extensions into that area. In these cases it is possible for a main to be laid provided that the prospective customers agree to meet the full cost. If you would like to discuss this further please contact our Network Department. If you require any further information please telephone the Jersey Water main switchboard on 707301.